Winner of the TonyMoly CC Cream and Clio Liner! | Memorable Days : Beauty Blog - Korean Beauty, European, American Product Reviews. 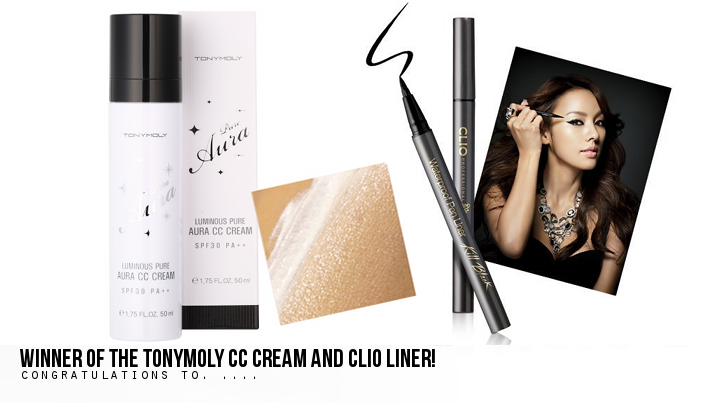 Winner of the TonyMoly CC Cream and Clio Liner! Thank you all for joining the Twofacemall.com giveaway where you could win a TonyMoly CC Cream and Clio liner. I received more than 2000 entries this time and it took me a while to check them all. Thank you Twofacemall.com for sponsoring the giveaway, make sure to visit their website for Korean products! Have you joined my current giveaway yet? Check it out since you can win some cute items and if you love Lee Min Ho, you gotta join haha ^^, join giveaway here! Congratulations! I will be sending an e-mail to you within these 3 days! A review about this CC Cream will be online soon, I've been testing it out for you girls!! !